Villa Mar Norte is a charming 4 bedroom property offering stylish interiors and plenty of space throughout. The heart of Moraira, with its great choice of bars, restaurants and shops, is just a short drive away, and the sandy Ampolla Beach is also nearby. 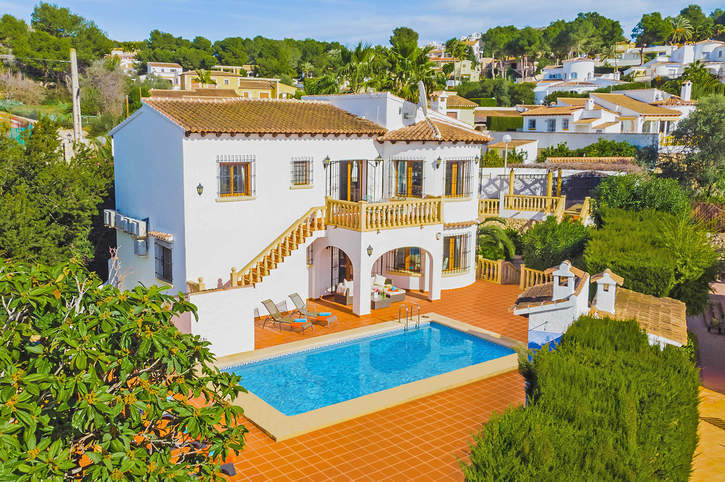 Spread over 2 floors with 2 kitchens and living areas, this villa is a great choice for families or groups wanting their own space. Pool heating, WiFi and air conditioning/heating in all the bedrooms are included. A bright and spacious villa, close to the heart of Moraira, with 2 kitchens and living areas! The inviting private pool is surrounded by a large, tiled terrace with plenty of room for sunbathing. There is a shaded terrace with comfortable seating area - great for relaxing with a good book. The traditional stone dining table is perfect for those alfresco meals, cooked on the adjacent brick BBQ. A flight of stairs leads up to the ground floor terrace above, and there are 6 steps down to a pebbled garden area with mature trees. There is parking to the side of the villa for your hire car, with a short path leading round to a flight of steps up to the front door. There is also a pedestrianised gate with a flight of steps down and a second flight back up to the front door. This villa has 2 separate living areas and kitchens - great for groups travelling together. The ground floor living and dining area has a bright and airy feel with traditional wooden beamed ceilings and large picture windows. The room is furnished with 2 comfortable sofas, a flat screen TV, a feature fireplace and a dining table with chairs. Patio doors open out to the terrace with a flight of steps leading down to the pool terrace below. An archway leads through to the fully equipped kitchen with plenty of worktop space. Downstairs, the lower ground floor living space is similarly furnished with 2 sofas, a flat screen TV and a dining table with chairs. Patio doors open directly on to the pool terrace and keep the room filled with natural light. The L-shaped kitchen is well-equipped for your holiday meals. On the ground floor are 2 double bedrooms that share use of a separate bathroom and shower room. Both the bedrooms are pleasantly furnished and have traditional wooden beamed ceilings. On the lower ground floor you'll find a 3rd double bedroom and a twin room, that share use of a separate bathroom. There is also a WC and utility room on this level. This villa is registered and licenced by the Generalitat Valenciana to comply with local legislation on holiday rentals. This number is: VT-454603-A. Villa Mar Norte is a detached property located just 5 minutes' drive from the centre of Moraira. Here you'll find a plethora of bars, restaurants, shops, boutiques and the lovely marina. You'll also have 2 Blue Flag beaches, El Portet and Ampolla, within easy reach by car. Set between Javea and Calpe, both just 25 minutes' drive away, you'll be in a great position to explore all Costa Blanca has to offer! If you want to leave the car at home, there are a couple of shops and a local restaurant within walking distance. Our villa Sargazos is nearby. The village of Moraira is 5 minutes' drive away and has a variety of boutique style shops. There is also an open air market on a Friday morning offering everything from leather goods to fruit and vegetables. For your holiday essentials the nearest supermarket is just a short stroll away. There is a local restaurant just a few minutes' walk from your villa, or head down to the centre of Moraira where you will find a plethora of options to choose from. You can enjoy fresh fish caught that day, traditional tapas or even burgers and pizzas. There are also plenty of bars with sea views - the perfect spot for a sundowner. La Ampolla is a lovely Blue Flag beach, with soft shelving sand and a lifeguard present during the summer months, making it a great choice for families. Alternatively El Portet, also Blue Flag approved, is a sandy cove surrounded by picturesque high cliffs. There is a small promenade with a few shops and restaurants. Moraira is a family-friendly resort with plenty of activities to keep everyone busy, from banana boats ride, jet ski tours and paddle boarding. If you'd prefer something out the water, why not try go karting, padel tennis or crazy golf? From the tiny castle on the seafront to the winding lanes, Moraira village is steeped in history and a fun place to explore. Further afield, the cities of Valencia and Alicante have lots of history and shopping, and make a great day out. San Jaime Golf Course and the Javea Club de Golf are both just 10 minutes' drive from your villa. In Denia there is a golf course at the Marriott Hotel and Spa, 25 minutes' drive away. There are plenty of walks either along the beautiful coastline or take a trip to Calpe and walk up the Ifach rock. Or head to Javea to try one of the many marked walks on and around the Montgo Mountain. Villa Mar Norte is not available to book for season as it is sold out. Take a look here at the Costa Blanca villas that are currently on sale.